F3Q is a two task contest for 'scale like' aero tow gliders. Each round comprises a duration task and a speed task. worst round score is discarded. The rules for F3Q are FAI provisional rules (at 5 November 2016). Deducts up to five worst Round scores at predetermined rounds flown. Score cards (for the duration task) can be printed from the Reports menu. Championship reports can be produced in two different ways. Multiple competitions can be selected into a Competition Series (see Main Menu → Competition Series). The Competition Series report can then be produced. 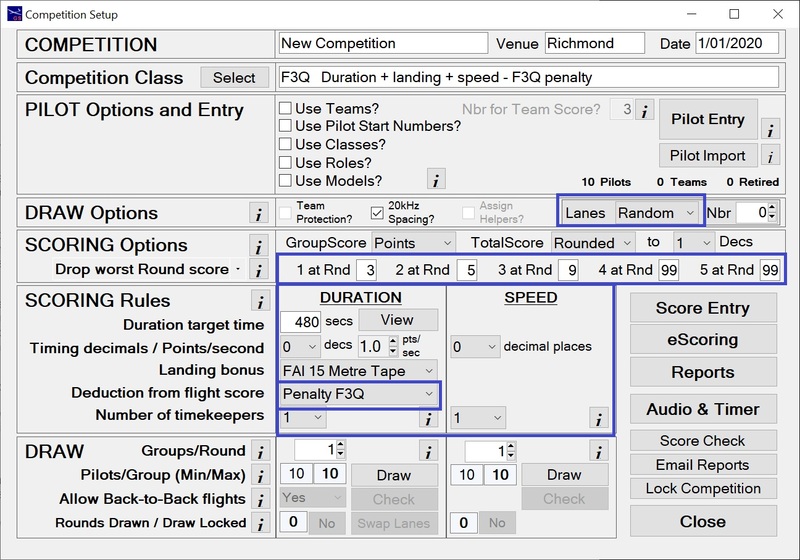 The rounds flown from multiple competitions can be merged into a single competition file (see Main Menu → Merge). The standard competition reports apply to the merged competition. Expand F3Q on the side menu to work through these features. Select 'Random' from the Lane Options. This creates the Duration launch order when the Draw is done. - Select 'Drop worst Round scores'. - Select the round numbers at which drop scores will take effect. - Key in the 'Duration target time'. - Select the 'Landing bonus' table.